On 22 September 2016, around 50 IT professionals got together at the Food for Thought network event at “Het ketelhuis” in Eindhoven. This session was again organized by The Orchestrate Group in cooperation with Purple Square Management Partners around the theme “Leadership in IT. Our world is constantly changing, and companies are continuously developing. Parts are divested, companies merge or acquire other companies. Every change has a direct impact on the IT landscape. IT strategy and architecture need to be adapted to the new situation and regularly updated. That requires clear and powerful leadership. Two interesting speakers were invited with each their own background on the theme of leadership. Bas Kodden is a researcher in the field of leadership, entrepreneurship and personal development at the Center for Leadership & Management Development of Nyenrode Business University. 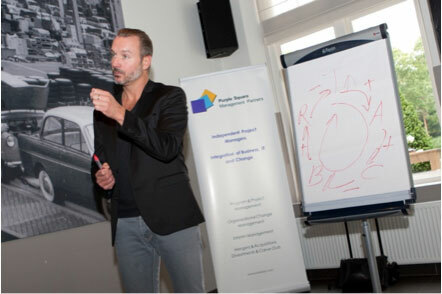 In his fascinating speech, Bas explained why enthusiastic people make the difference in organizations. He challenged those present in the room to behave as HELD, High Energetic Leaders. Being satisfied with your work is not enough, nor does working hard. Flow, passion and enthusiasm ensure that heroes make the difference. He succeeded in binding the listeners with striking examples and a lot of interaction. 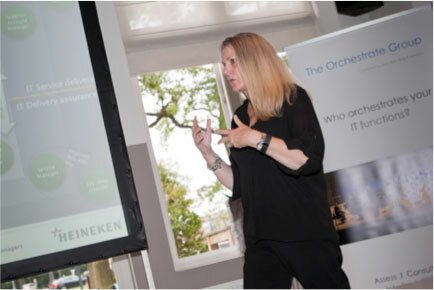 Anne Teague, as a former CIO of Heineken, gave a glimpse into the complexity of IT in a multinational. This story, larded with recognizable themes from the daily practice of IT professionals, gave an excellent insight into topics such as influence, behavior, building relationships, with which IT leaders support their policies. A thorough IT strategy is a prerequisite for supporting the organization. Added value as an IT professional through the relationships you build with business leaders and users, through the leadership you demonstrate in transforming the IT function from supplier to business partner. After the key note presentations, a panel discussion took place based on challenging statements to make the audience reflect on the theme of the event. The event was closed with an informal drink, where the attendees discussed the topics with old acquaintances and new contacts. Food for Thought is organized twice a year. Check out our news page to see when the next Food for Thought will be held. Automated Driving – A driver’s license will not be needed in the future, or will it?